How are you packaging your brand? Anyone with access to the internet can search through thousands of sites for just the right product, order it instantly, and have it delivered in a matter of hours or days. This growing demand for shipping and faster deliveries affects many businesses. One important piece of the new way we’re doing business is the dramatic increase in packaging and shipping costs businesses have taken on. 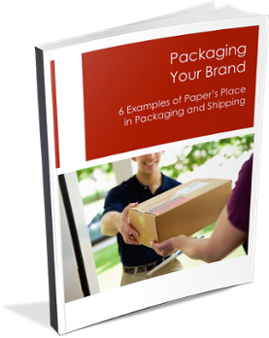 Simply fill out the form to the right and you’ll receive your free copy of “Packaging Your Brand: 6 Examples of Paper’s Place in Packaging and Shipping” instantly.